Solid, dependable, consistent. The Last Man (or woman) is the furthest defender back and the foundation on which a team’s defense will be built. Nearly all good 5-a-side teams play with somebody in this position and in this article we explain what it is all about and how your team can improve by focusing on it. This is just one way that you can tighten up your defense for 5-a-side. See our Ultimate Guide to 5-a-side Defending for more tips. What is the Last Man? It might sound like the last person alive in a post-apocalyptic world, but the Last Man refers to the player who has the primary responsibility for providing defensive discipline and organising the defense from the back. As they’re often the player furthest back they earned the term ‘Last Man’. Although teams may like to think of themselves as playing ‘total football‘, with all players freely rotating between positions, most teams struggle without dividing up at least some responsibility for defending and attacking. Formations can be quite fluid when it comes to 5-a-side but most of the best teams play with someone who commits to stay back and sort out things from a defensive point of view – it’s this gatekeeper of the defense that we refer to as the Last Man. Discipline to maintain a defensive position and not simply maraud forward abandoning all defensive duties out of heroism / boredom. Leadership and communication to give clear instructions to the rest of the team. Reading of the game – as the Last Man is often the furthest player back, he might be the only person who has a full view of all of the opposition players and is usually in the best position to decide how the team adapts. Consistency and decision making – a good defensive player will know when to try to intercept the ball and when to hold position; when to tackle and when to jockey a player; when to run with the ball and when to play a simple pass. It’s worth selecting the right player to be your key defender. It’s not simply where you should look to hide your weak link, as this is one position which will be quickly exploited by decent opposition. Most of the time the Last Man will be marking the opposition’s player furthest forward (player Z in the diagram above). If the ball is passed forward by the player in possession (player X) the Last Man should be ready to see if he can intercept the ball and cut off the supply. Making an interception as the last defender requires careful judgment since if the interception is missed, this will leave the opposition player through on goal with only the goalkeeper to beat. If there is any doubt, err on the side of caution and instead position yourself to stop the attacker turning when he receives the ball. By getting close to the attacker and pressuring him so that he is not able to simply turn and face the direction of the goal, player A can prevent the opponent having the opportunity to dribble past him or shoot. If the player has already turned to face the goal, then player A, must decide what to do to prevent him having a goal-scoring opportunity. The cardinal sin in this situation would be to dive in with a speculative tackle missing the ball, leaving player Z with only the goalkeeper to beat. Instead, a patient approach of both being close enough to stop the shot, whilst avoiding being dribbled past, is required. It is usually most effective to shepherd the opposition player away from goal and into the corner in this situation. As the furthest player back with the best view of the action on the pitch, the Last Man is able to direct teammates to make sure that each player is marked. In the diagram above, player X has the ball for the opposition. If he brings the ball forward, defender C may be tempted to move towards him to try to win the ball. This would leave attacker Y in lots of space on the left side of the pitch and, if his teammates were able to find him, it would lead to a goal-scoring chance. Defender C might not be aware of Y running in behind him but the Last Man should be able to alert him to the danger. A clear, simple instruction such as “Dave, left shoulder” should be enough to make sure that C holds his position, leaving defender B to instead apply pressure to the man with the ball. Through reading the game from the back and communicating with the other players the last man can really tighten up the defense for a team. Not only does the Last Man need to be aware of the player he’s marking getting in behind him, but he also acts as a sweeper for any balls played in behind the other defenders and himself. In the diagram above, if attacker X plays a pass in behind defenders B or C then the Last Man (A) should be looking to meet the pass and regain possession, especially if the ball is played into the area shaded in the diagram behind him. Should the Last Man Always Stay Back to Defend? No. The best players of this position will also be very comfortable bringing the ball forward. If the Last Man is not able to provide some offensive threat then play will become predictable. They should provide depth for the team when attacking, looking to be an outlet for a pass and to distribute the ball on to teammates. Because the Last Man is usually attacking from deep, the position also lends its self well to players who are able to accurately shoot from distance. The opposition will not expect the Last Man to dribble the ball so, when it is safe to do so without fear of giving away a goal if they are tackled, an occasional run can be an effective way of creating chances for themselves or teammates. It often goes wrong for teams when their defensive player moves forward to attack and nobody drops back to offer temporary cover. Inevitably this leads to the opposition having a player free with only the goalkeeper to beat. Other players therefore need to be aware that they need to cover for the Last Man if he ventures forward. After a short time the defender should be able to return back and release forward the covering player. It is important that when the Last Man gives defensive instructions that teammates respond to him. They too should also be giving defensive instructions and not just relying on his instructions. Some teams choose not to give any one player the main responsibility for the defence, instead using two (or even three) defensive players, allowing them to attack as the opportunity arises. Whilst this works well for some teams, the failure to charge one person with the main defensive responsibility can lead to confusion with nobody taking enough responsibility. At least with the Last Man approach, there is a player who will more often than not be sitting back, will organise others, and who players know they have to cover for if he goes forward. 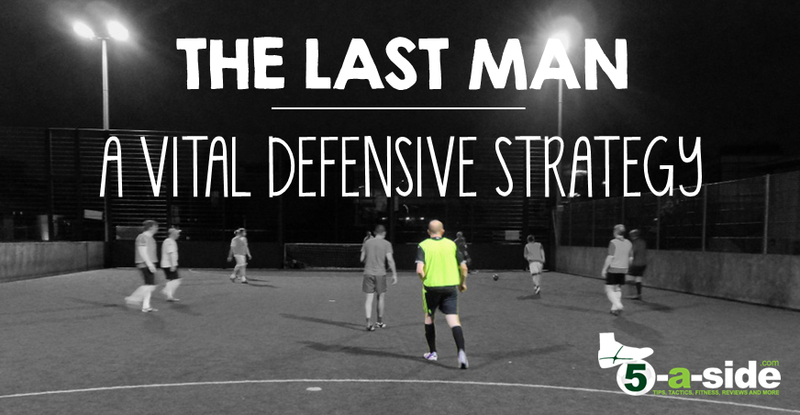 5-a-side formations – The Last Man is only one piece of the puzzle. You need to make sure that the whole team knows their jobs – decide on a formation. How to play against a better team – Sometimes the opposition is just better than you. The good news is, that doesn’t mean you have to lose! Could you please give any tips for a 3-man defense? I am in a tournament and we are a very weak team, yet I believe we can win if we score at least one, and defend tightly. Thanks for the comment. Don’t want to bore you with all my hosting stuff, especially since your site loads up faster I think!